I can’t think of too many places I would rather spend a cold, winter afternoon than Le Bernardin. This marvelous, indulgent lunch was full of surprises. The dreaded call came that morning. “Schools will be closed,” the recorded announcement said. Are you kidding? When it was all said and done we saw maybe two inches of snow that melted quickly, but I suppose extreme caution is better than taking unnecessary risks. In any event, we had a day of meetings planned in Manhattan, including lunch at Le Bernardin. There was only one option. Admittedly with some trepidation, we took our son, age seven, with us. It turned out to be a great day. The staff could not have been more accommodating. A few minutes after we were seated I turned to greet one of our guests. Before I knew it, my son had been served Ginger Ale in a Zalto flute. Talk about class and hospitality. Given the traffic snarls and overall confusion caused by the weather, the last thing I wanted to do was look at a menu and make decisions. We asked the kitchen to choose our menu while Chef Sommelier Aldo Sohm took care of the wines. What followed was a fabulous succession of courses, all of which were wonderfully indulgent yet not excessive. 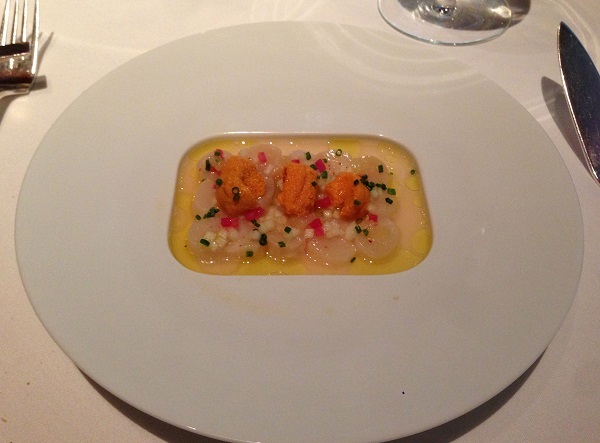 I often order Nantucket Bay scallops at Le Bernardin. This preparation with sea urchin is delicious, especially in the way the ingredients play off each other. The sea urchin adds a measure of texture, but the vinaigrette cuts through all of that intensity beautifully. 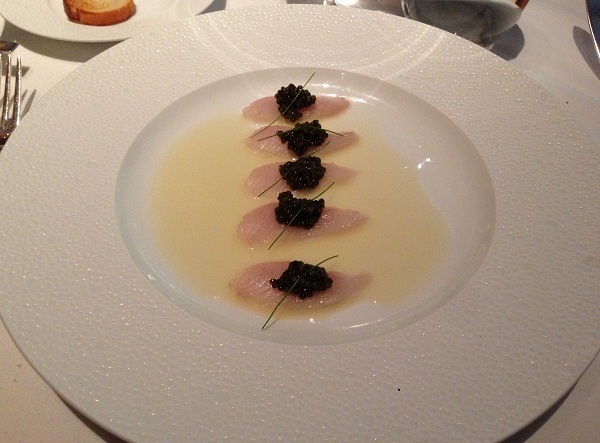 The warm king fish sashimi topped with Osetra caviar is another super-indulgent dish. What can I say? Sashimi and caviar is about as good as it gets in my book. This is a classic Le Bernardin dish that is quite rich, but never heavy. I almost asked for seconds. 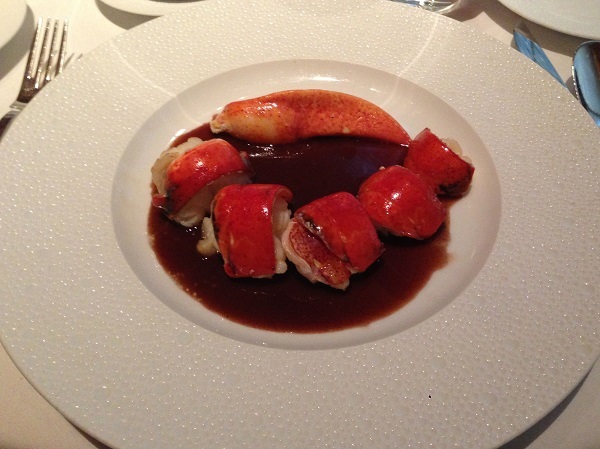 Many of Chef Eric Ripert’s lobster dishes are perfect for red wine. The pan-roasted lobster, served with a red wine reduction sauce is simply stunning in its simplicity and sheer deliciousness. Side dishes of truffled salsify pretty much disappear instantly. 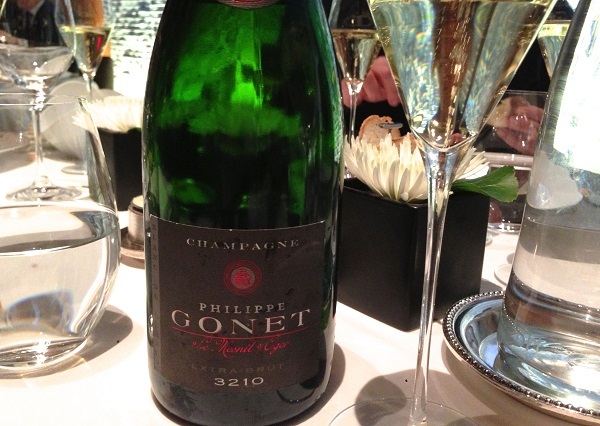 Philippe Gonet’s NV Extra Brut 3210 is a great start to this lunch. Rich, textured and enveloping, the 3210 offers gorgeous depth and richness. It is maybe just a touch too intense for the scallops, but perfect with the Osetra caviar that follows. The 2008 Chablis Fourchaume from Nathalie e Gilles Fèvre is attractive and surprisingly open at this stage. I would prefer to see a little more tension, but all the elements fall into place in a succulent, expressive Chablis that will drink well for at least another few years. The next wine is served blind. I have no idea what it is, but the rusticity suggests the Rhône Valley. It’s most certainly not Burgundy and Italy is out of the question. But it’s definitely Old World. Has to be. 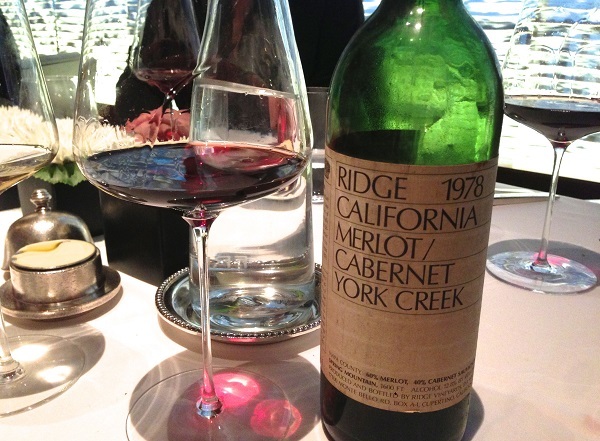 Well, the wine turns out to be Ridge’s 1978 Merlot/Cabernet York Creek. Still delicious and vibrant to the core, the 1978 is flat-out beautiful. The textures and flavors of this fully mature Spring Mountain red are pure pleasure. This is a stunning early masterpiece from Paul Draper. What a bottle! We need a last drop of wine to finish off the cheese course. The 2009 Giacomo Conterno Langhe Nebbiolo Cerretta is gorgeous. I have never truly loved the 2009, but today the Cerretta is notable for its freshness and sense of harmony. As we were going home, I did my best to impart some wisdom to my young son. “You’ve just had lunch in the best restaurant in New York,” I said in a fatherly tone. “But dad, you haven’t eaten in every restaurant in New York,” came back the reply. Touché….